The same elderly that gave my family bánh tet, made us some bánh cam! Glutinous rice balls with mung bean and shredded coconut filling, and with sesame seeds on the outside. The name bánh cam literally means “orange cake” because these balls simply resemble oranges, not because there are any actual oranges in it. There’s wonderful harmony in bánh cam. 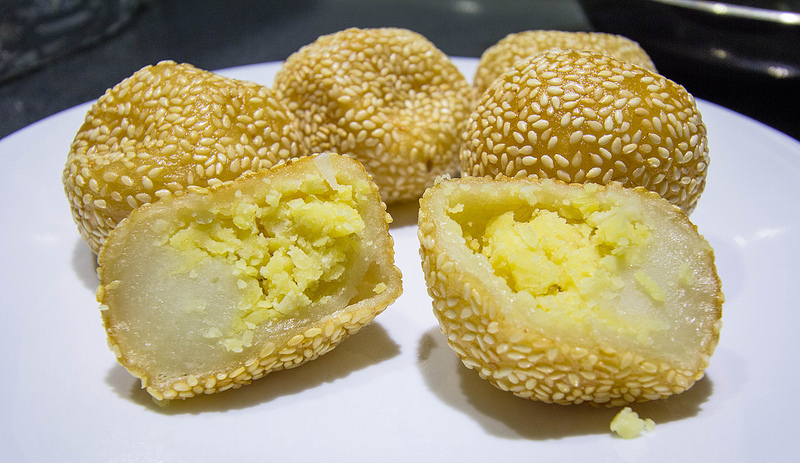 The outer shell is a warm golden brown color covered in white sesame seeds. The exterior has a satisfying crispiness to it from frying. On the other side of that surface is a lightly chewy or springy glutinous rice dough and a sweet ball of mung bean. Fans of bánh cam can get pretty picky about this balance between the crisp and chew. Although they look very similar, there are differences between bánh cam from the South and bánh ran from the North. Both styles can be found throughout the country though. Northerners call it bánh ran, or “fried cake”. These are made with a Jasmine flower essence for a nice aroma. A sugary drizzle on these fried goodies can be found on them depending on the vendor. Another difference in the north is that when they are covered in sugar, the dough is made only with sweet rice flour and no rice flour, sesame seeds, or potatoes. Southerners call it bánh cam, or “orange cake”. There is no essence of flower added to this. The most popular flavor added to the mung bean filling is with drops of vanilla extract. Only in the South will you find freshly shredded coconut in the filling too, but that will vary by vendor.